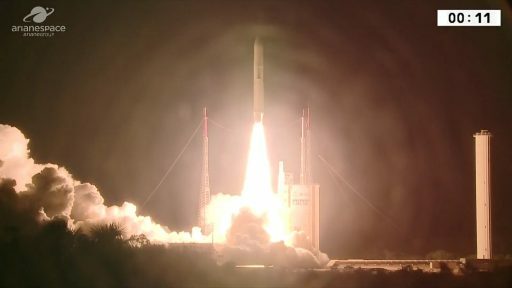 Riding on pillars of fire and smoke, Europe’s Ariane 5 rocket blasted into the sunset over French Guiana on Friday, heading off on its final Geotransfer mission of the year with a pair of particularly heavy satellites for operators Intelsat and B-SAT to support a global network of cutting-edge communications satellites and beam down 8K Ultra-High Definition Television. Ariane’s fifth mission of the year started at 21:56 UTC when the 55-meter tall rocket jumped off its ELA-3 launch pad at the Guiana Space Center, rising into the twilit skies over the edge of the Amazon jungle before turning eastward under the power of its trusted Vulcain main engine and twin Solid Rocket Boosters that did most of the work for the first 135 seconds of the flight. 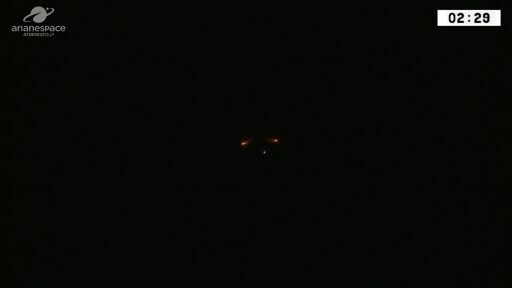 After the boosters dropped away, Ariane 5 split open its payload fairing and continued on the first stage until just shy of T+9 minutes when the second stage took over for a 16 and a half-minute burn of its engine to accelerate the stack into a highly elliptical Geostationary Transfer Orbit. Ariane 5 performed admirably while its engines were powering the vehicle into orbit and continued with a 22-minute ballistics phase to deliver the satellites into slightly different orbits with the 7.9-meter tall Intelsat 37e departing the stack 30 minutes after launch followed by the release of the smaller BSat-4a 17 minutes later to enable both to head off on their respective missions. Friday’s Ariane 5 launch marked the rocket’s 95th mission and the 81st consecutive success for the workhorse launcher with one more flight to go in 2017 after Arianespace adjusted its manifest from an initial expectation of seven heavy-lift mission this calendar year. 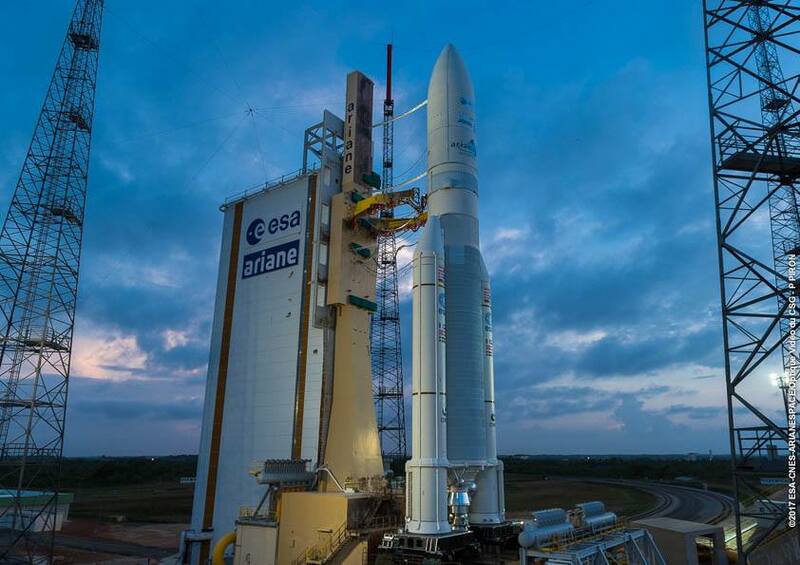 The last Ariane 5 mission of the year will utilize the ES variant of the rocket for a boost into Medium Earth Orbit with the next four satellites joining Europe’s Galileo Navigation Satellite System. 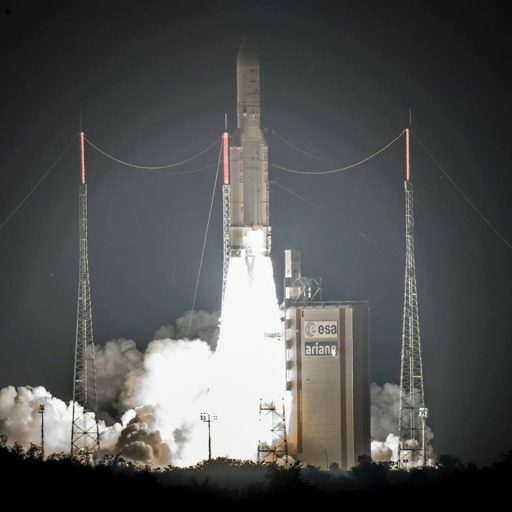 Friday’s launch marked another bread-and-butter mission for the Ariane 5, employing its ECA high-performance version to lift a pair of satellites into Geostationary Transfer Orbit – representing the vast majority of the launcher’s business nowadays. In fact, Friday’s mission was the vehicle’s second heaviest GTO delivery with a total payload upmass of 10,838 Kilograms amassed by the two satellites and their adapters. 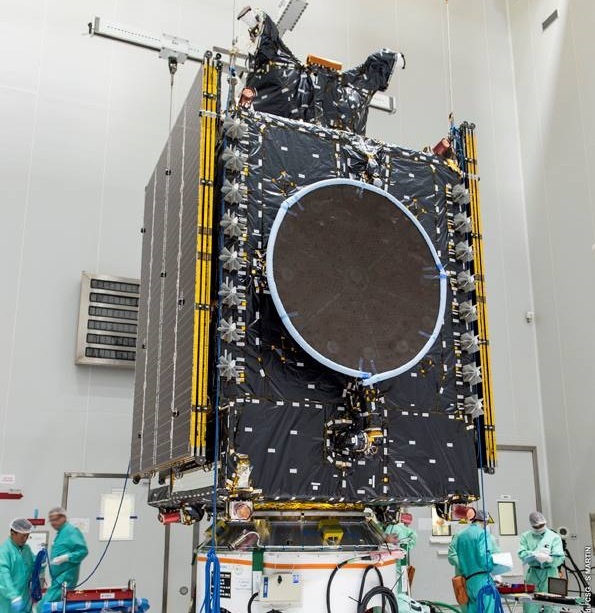 Riding in the front seat was Intelsat 37e, a massive communications satellite built by Boeing based on the 702MP platform for operation by Luxembourg’s Intelsat as part of the company’s satellite fleet. The 6,438-Kilogram satellite is the fifth in the company’s Epic-NG series that delivers flexible coverage across the globe, leveraging the latest advances in satellite technology such as multi-band payloads, frequency re-use, power sharing capabilities and a combination of beam widths to deliver data-intensive services via fixed and steerable spot beams and broadcasting services through wide coverage beams. The Intelsat 37e satellite hosts 90 C-Band, 275 Ku-Band and 37 Ka-Band transponders (36 MHz-equivalent units) covering the entirety of Europe, Africa and South America plus the Eastern U.S. and Canada. 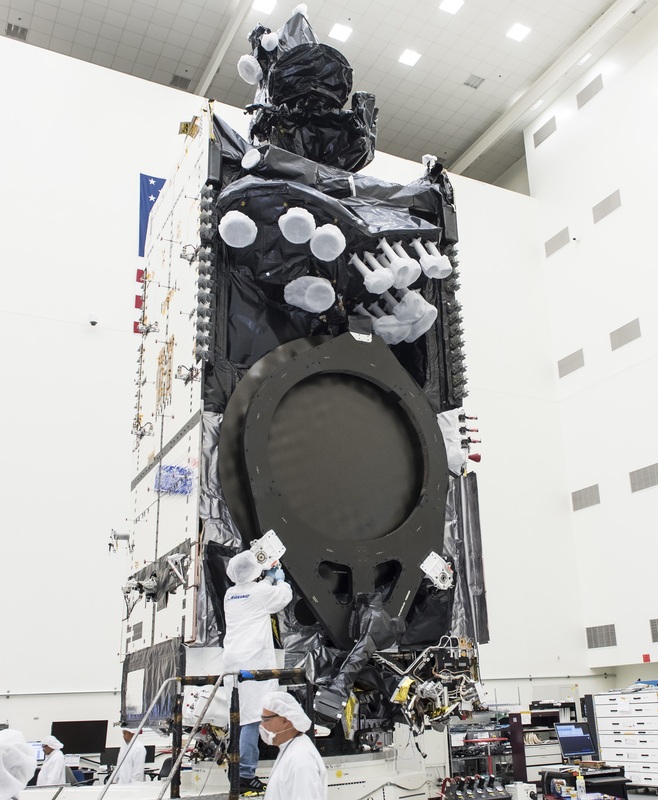 As the first satellite to use advanced Epic technology in all its bands, Intelsat 37e will deliver wireless backhaul, VSAT, enterprise and mobility services. Steerable beams in Ku/Ka-Band enable capacity to be directed where it is needed and enhanced power sharing capabilities for flexible assignment of power between shaped, fixed and steerable spot beams allows for an optimization for in-demand applications by region. Intelsat 37e will operate for at least 15 years from an orbital location at 18°West where it will replace the 16-year old Intelsat 901 satellite that is being decommissioned after surpassing its planned service life. Heading into in the lower payload berth for the smaller of Ariane’s two passengers was the 3,520-Kilogram BSat-4a, operated by Japan’s Broadcasting Satellite System Corporation (B-SAT) and built by Space Systems Loral based on the popular SSL-1300 platform. The satellite carries an all-Ku-Band payload with 24 transponders for Direct-To-Home Television distribution in standard and high-definition formats as well as the 4K and 8K Ultra-HD resolutions. Spiraling up into Geostationary Orbit, the BSat-4a satellite will park at 110° East where it will initially provide expansion coverage with focus on 4K/8K before eventually taking over for the BSat-3a satellite that entered service in 2007. The satellite is being launched in 2017 to provide a maximum of margin before the 2020 Olympics in Tokyo which are planned to be broadcast in 4K and 8K though BSat-4a. BSat-4a was ordered under a delivery-in-orbit contract in which SS/L procures the launch service for the satellite and is responsible for maneuvering the satellite into its operational orbit and completing all necessary testing & commissioning activity before turning the craft over to B-SAT for operational services. The fifth Ariane 5 launch of the year enjoyed smooth early launch campaign until hitting a bump in the road when it had already passed the point of main engine ignition on September 5. Due to a problem sensed by the vehicle’s onboard computer within an electronics component on one of the boosters, Ariane 5 triggered a shutdown of its engine – marking only the third post-ignition abort in the rocket’s two-decade career. Ariane 5 returned to the Final Assembly Building to undergo replacement and re-testing of the suspect component as well as refurbishment on the Vulcain 2 engine after being fired. Coming back from a 24-day delay, Ariane 5 rolled out to the ELA-3 launch pad Thursday afternoon after all re-checks showed the launcher systems to be ready. 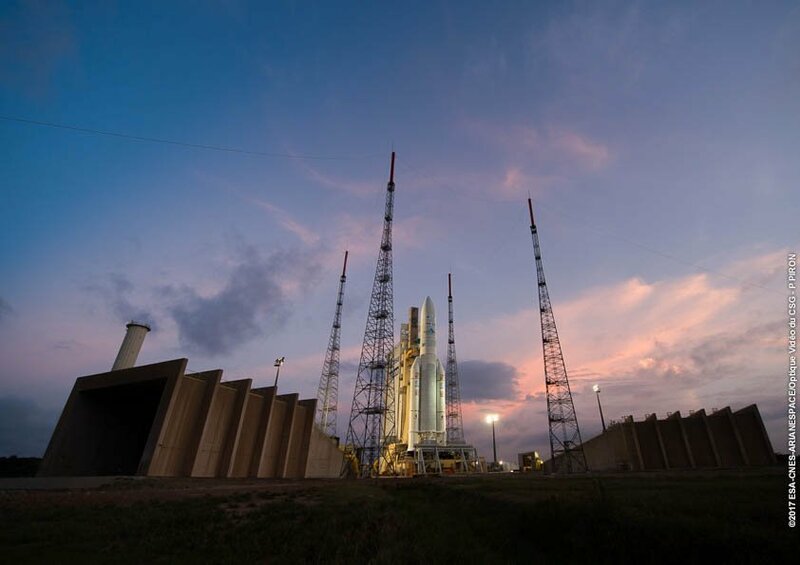 In position for liftoff, Ariane 5 entered a lengthy countdown of 11 hours and 23 minutes early on Friday, starting with power up of the launcher before an extensive testing campaign to award the vehicle a clean bill of health before tanking. All workers departed the launch complex by T-5 hours to allow 185 metric tons of -183°C Liquid Oxygen and -253°C Liquid Hydrogen to be pumped into the EPC first stage and ESC-A cryogenic second stage. 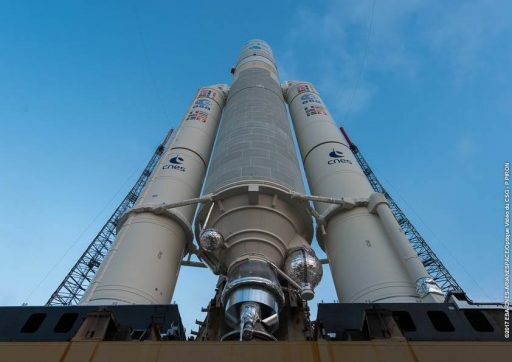 Loaded up on cryogenics, Ariane 5 stood fully fueled while final preparatory steps were run to transition the two satellites to battery power before the countdown switched into automatic mode at the T-7-minute mark after a brief delay due to an open item on the ground system. 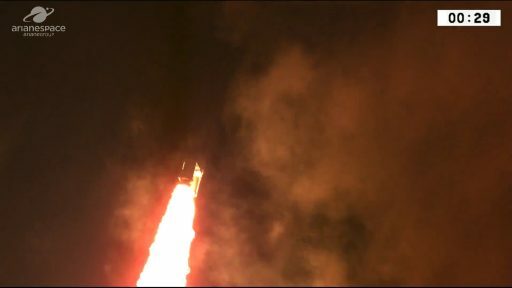 Under supervision by computers, Ariane 5 closed out propellant loading and started pressurizing its tanks, switched to internal power and configured its flight computers for launch with handoff to the vehicle occurring just seconds before ignition, coinciding with the retraction of the upper stage feed arms. The Vulcain 2 engine started breathing fire once again when clocks hit zero, ramping up to a launch thrust of 96 metric-ton-force under close watch by computers that ensured the engine was up and running before commanding the twin boosters to light up, marking the point of no return. 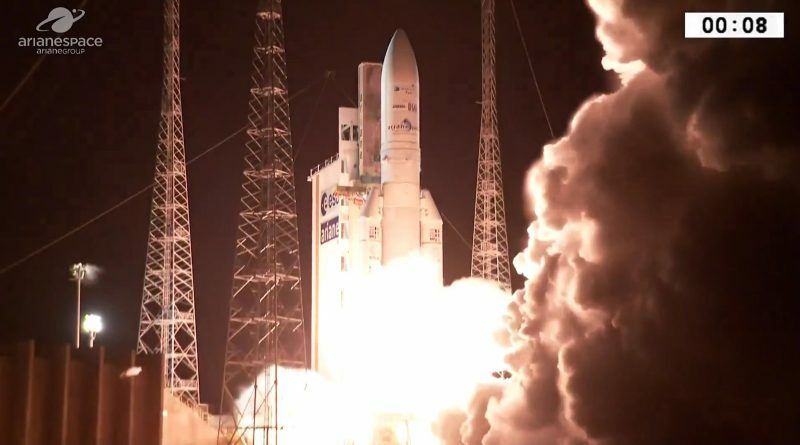 Ariane 5 jumped off its launch pad at 21:56:07 UTC, just over twenty minutes after sunset at the equatorial launch base – lighting up the night over the French Guiana coast line as the launcher headed off with a total thrust of 1,420 metric-ton-force. 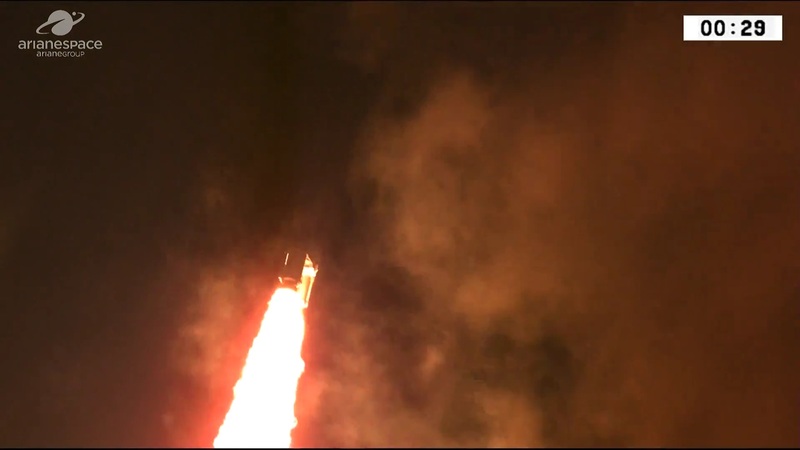 A brief vertical climb was followed by the usual pitch and roll maneuvers that aligned Ariane 5 with an ascent path taking it straight east for a quick overflight of the Atlantic Ocean. Burning some 3,600 Kilograms of propellant per second, Ariane 5 pushed through the sound barrier at T+49 seconds and encountered Maximum Dynamic Pressure at T+73 seconds when passing through 13 Kilometers in altitude. 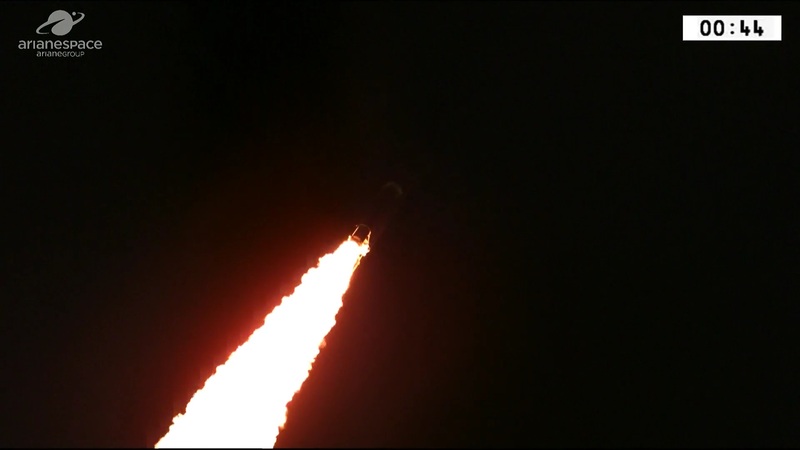 The boosters did most of the work during the initial phase of the flight, each consuming 237 metric tons of solid propellant over the course of a two-minute and 15 seconds burn, helping Ariane 5 to accelerate to a speed of two Kilometers per second. The 31.6-meter long EAP boosters separated at T+2 minutes and 22 seconds, 65 Kilometers in altitude when Ariane’s onboard computers sensed the declining chamber pressures after the boosters ran out of propellant. With the boosters gone, the ascending launch vehicle relied on the core stage’s Vulcain 2 engine alone, delivering a thrust of 136,600 Kilogram-force when flying in the tenuous upper atmosphere. Having departed the dense atmosphere, Ariane 5 split open and separated its 17-meter fairing halves three minutes and 23 seconds into the flight, shedding no-longer-needed weight as aerodynamic forces were no longer a danger to the satellites at altitudes of 112 Kilometers and above. The first stage consumed its supply of 170 metric tons of LOX and LH2 after eight minutes and 56 seconds, having boosted the vehicle to a speed of 6.96 Kilometers per second. 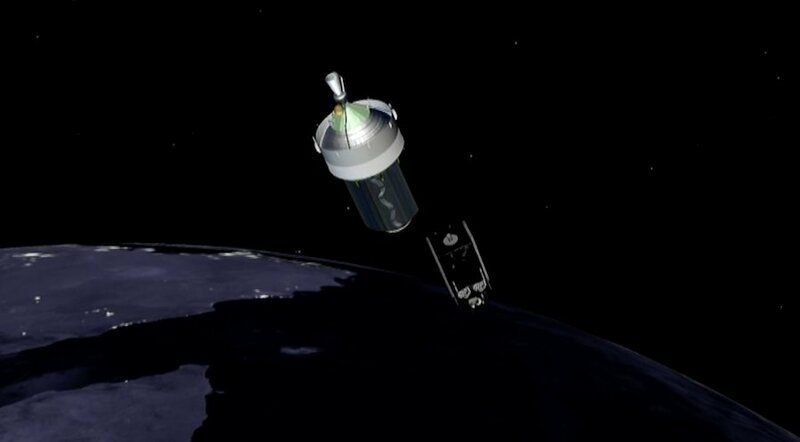 Four seconds after shutdown on the EPC, the 30.5-meter long stage separated 140 Kilometers over the Atlantic Ocean, clearing the second stage for ignition. The 6,400-Kilogram-force HM-7B engine on the ESC-A second stage came to life nine minutes and four seconds into the mission, starting out on a lengthy propulsive flight phase of 16 minutes and 25 seconds to boost the stack into a highly elliptical orbit. 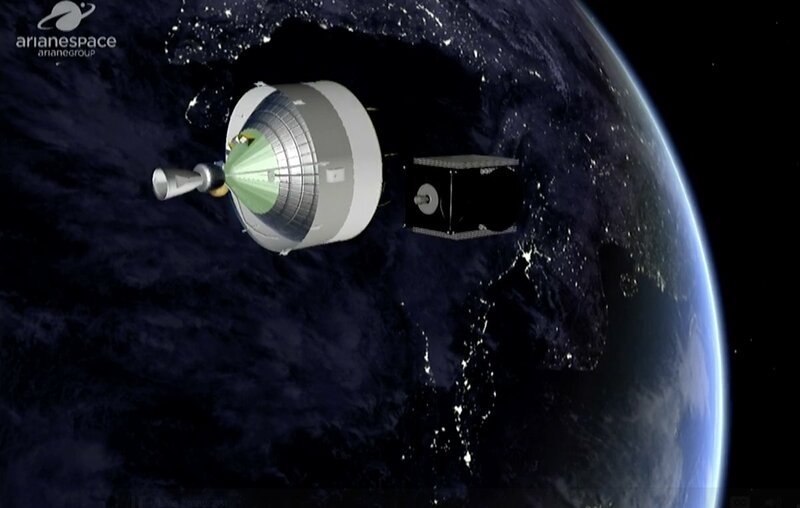 Tasked with accelerating the stack by another 2.4 Kilometers per second, the upper stage continued trekking east, being handed to downrange ground stations in Brazil, on Ascension Island and finally in Africa at Gabon and Malindi to cover the entirety of the mission. 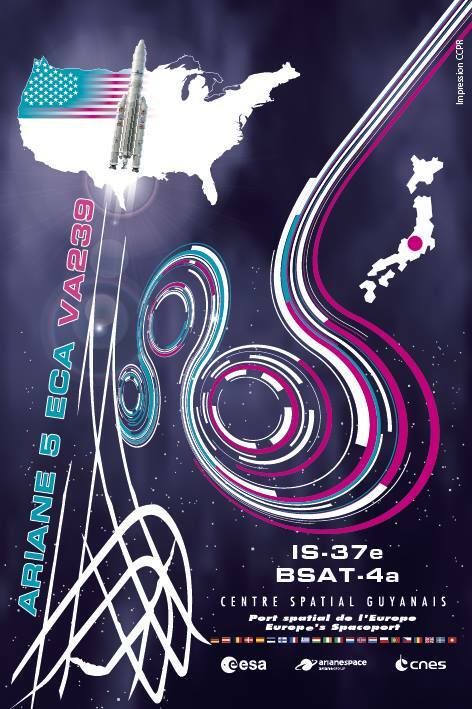 The VA239 mission aimed for an orbit of 250 by 35,706 Kilometers at an inclination of 6 degrees, taking advantage of French Guiana’s low latitude to inject the satellites into a low-inclination orbit to decrease their fuel expenditure when climbing to their operational orbits. Having reached Africa’s west coast, the upper stage shut down its main engine – trading the raw power of its rocket motor with the precision of its cold-gas thrusters that were up for over twenty minutes of maneuvering to dispatch the two passengers onto safe orbital paths. Springs pushed the heavy Intelsat 37e away from the Sylda adapter 29 minutes and 50 seconds into the mission, embarking on its initial orbit raising campaign to take up station over the Atlantic Ocean to start out a multi-week commissioning campaign, getting ready to service four continents and the Atlantic region. With the first satellite on its way, ESC-A completed a re-orientation before dropping the Sylda adapter that held the upper passenger and enshrouded BSat-4a in the lower payload berth. It was another 15 minutes of maneuvering after Sylda operation before BSat-4a was deployed to ensure no objects released by this launch would re-contact. BSat-4a separation 47 minutes after launch was met with applause at launch control as Ariane 5 advances its success streak, having been without failure since 2003. For Ariane 5, the mission ended with the usual twenty-minute passivation sequence that included spinning the second stage up, venting down all tanks and powering off onboard systems. Arianespace will be in action again on November 7/8 when Vega will make a nighttime liftoff to deliver the MN35-13 (Morocco EO Sat 1) Earth-imaging satellite for Morocco. The three-week delay to VA239 will have no effect on the VA240, currently looking at liftoff on December 12.